Falling back in Love with Fiji – Kua na Leqa, Marua Tiko! Ohhhh where do I begin? In my last blog post I reflected on my past 12 months in Fiji. If you read it, you know there were ups and downs. A couple weeks ago, I was in my lowest. I called my mom crying saying I wanted to leave and just come home. It got too hard, too many minor things were bothering me and then I witnessed child abuse. This was a tipping point that made me want to give up. Maybe I’m not strong enough to be here. Maybe this isn’t for me. Why the f#^]+ did I think being gone for 2 years would be ok? All these thoughts went through my head. I would’ve loved to snuggle up with my dog and just cry feeling so trapped. But my dog rolled in horse droppings and I didn’t have water to give him a bath so I just laid in front of my fan instead. I journaled, meditated, read, went on walks, really focused on self care. Being in nature was the one thing that really helped the most. I found a new place near my village with trees to climb up and sit in to read, I call it the goat sanctuary because the first time I climbed a tree there about 15 goats came running over to me. I felt like Snow White when the animals surround her. I’ve been reading a self empowerment books or as the rest of the world would call them “self help” books. Focusing on self care has been my top priority lately and really it should’ve been my top priority all along, “you can’t pour from an empty glass.” I don’t know who said that, but that quote holds very true for my Peace Corps service. I feel better now. Much better. I pulled myself out of the slump and got back on my feet, thanks to endless self care that I’ll continue to do and conversations with people who mean the most to me. I feel fresh and rejuvenated, ready for whatever Fiji throws at me. Peace Corps really is like a wild rollercoaster. My sister visited the week after I got out of the slump and if I wasn’t already out of the slump this surely would’ve pulled me right out! It was so fabulous having her in my village! We didn’t have running water and didn’t even have electricity at times either but we had lots of fun! We hiked with the kids, swam in the river, and did some touristy things like snorkeling and visiting a floating bar. But what made me really fall back in love with Fiji was the human connections. The people in my village who were there all along. Having my sister here who was excited to meet the people and do things with them was all the motivation I needed. I had so much fun swimming in the river with everyone – why don’t I do this more often?! I thought to myself. Especially without running water, a river bath is fabulous! I feel so grateful for Jade coming to visit; she was a trooper with no water, sketchy cell service, iffy electricity, rats and hornets in my house, and the good ole Fijian heat. She even plans to visit again! Eeep! 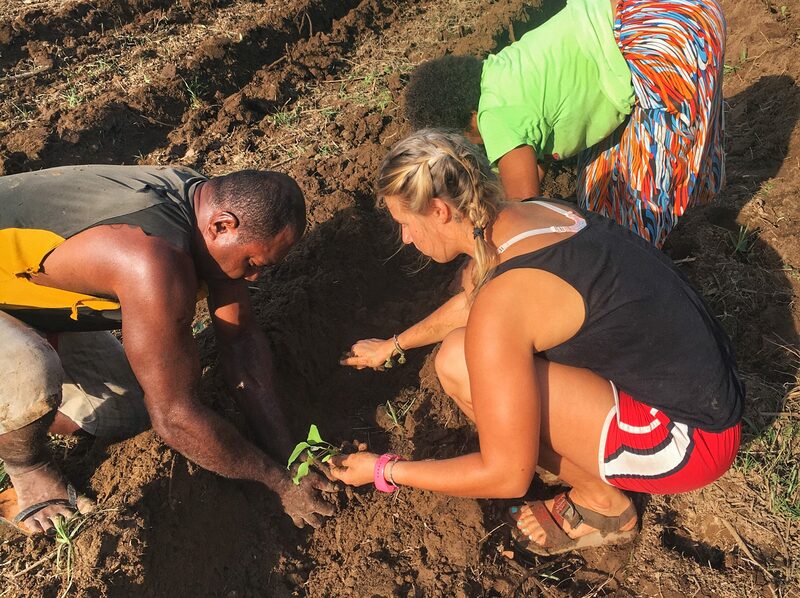 I loved seeing my village through fresh eyes and experiencing a new side of Fiji. Who knew Fiji had such a beautiful ocean?! My newest form of self care is swimming in the river with the kids. It’s a great way to hangout with them while also exercising AND being outdoors. It’s a triple threat. Just yesterday a boy and I had a race swimming backwards and a girl admired us swimming on our backs and said she didn’t know how to do it. I showed her how and held my hand on her back while guiding her along. Right away she knew how to do it (she just needed a little nudge), I let my hand go and watched her swim on her back on her own. She jumped up with a big smile on her face and said “I did it!” Her happiness and excitement made my day. Some of these kids really warm my heart. What are things that you do for self care? Or something you would like to do more? I’m ready to tackle year two. Let’s do the damn thing.